Matsuage Torch Lighting Ritual is a fire festival held in August in Hirogawara, Sakyo-ku, Kyoto to pray for commemoration of the souls of ancestors as well as for fire prevention and rich harvest. 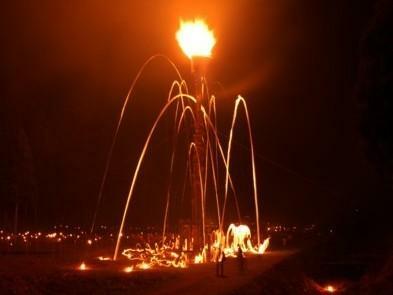 It originates in the tradition of bonfires offered to the deity of fire on Mt. Atago in the western part of Kyoto. 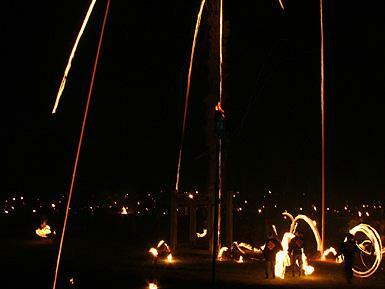 Later it was introduced to the nearby villages by mountain practitioners.In Matsuage (hurling up) ritual, 1,200 torches are set on fire one after another. The flames of the torches spreading in the darkness are overwhelming. 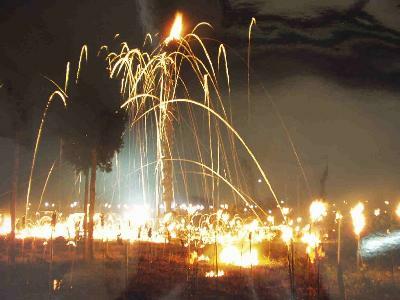 Then at the sign of a drum and gong, men began to hurl up burning torches at mass of dry grass called “Ogasa” fixed atop the 20 m tall pole called “Torogi” made of Japanese cypress wood. As they hurl them up, they twirl them many times to give momentum and leave multiple of circular trails of fire, which is very fantastic. The climax is when Ogasa is set on fire and the Torogi is pulled down to the ground. Numerous fire sparks beautifully soar up into the dark sky.